I think many of us have a tendency to think that American history begins with the Pilgrims and Jamestown. We sometimes forget that a whole lot of action was taking place in the southeast portion of the United States, in particular St. Augustine. It is worthwhile to visit and immerse yourself for a couple hours at the Castillo San Marcos and learn about some of the first arrivals on US shores. On our visit, this was our first trolley stop and we were greeted by a costumed Spanish soldier who told us that really this was considered a castle not a fortress. We arrived just in time to see e the firing of the cannon. We enjoyed our walk through what was the northernmost outpost of Spain’s empire. The fort is the oldest masonry fort and the best preserved example of a Spanish colonial fortification in the continental US. 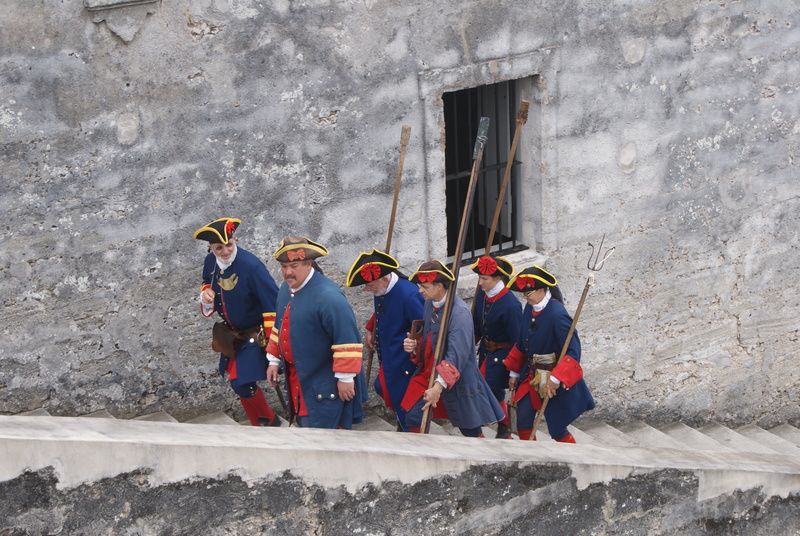 The Fort protected citizens in the walled city from pirates, the British and other intruders. Before establishing the fort, the Spanish fought off an attempted attack from the French ships that sailed from Fort Caroline. The ships were mostly destroyed in a storm and those that survived were executed. Our trolley guide Jim Kimbrough said Jim that the bay ran red with blood and that is why the name Matanzas, Spanish for “slaughters” has remained to this day. Learn about this history by clicking on to the website http://www.nps.gov/casa/index.htm. Next Post: St. Augustine Eco Tours, sightseeing from the water! Hello there! This post couldn’t be written any better! Reading this post reminds me of my previous room mate! He always kept chatting about this. I will forward this post to him. Pretty sure he will have a good read. Many thanks for sharing!